May 10, 1973 was the grand opening of the Cloth Haus. Located at 111 Main Street The Cloth Haus was a store that became a favorite among those involved in any type of sewing. The first 100 ladies to visit the store received a free carnation. Prizes to be given away included a Unoque Dress form, a $15.00 gift certificate, a pair of Fiskar scissors and a Dritz Cutting Board. The Cloth Haus featured all types fabrics, patterns and sewing accessories. 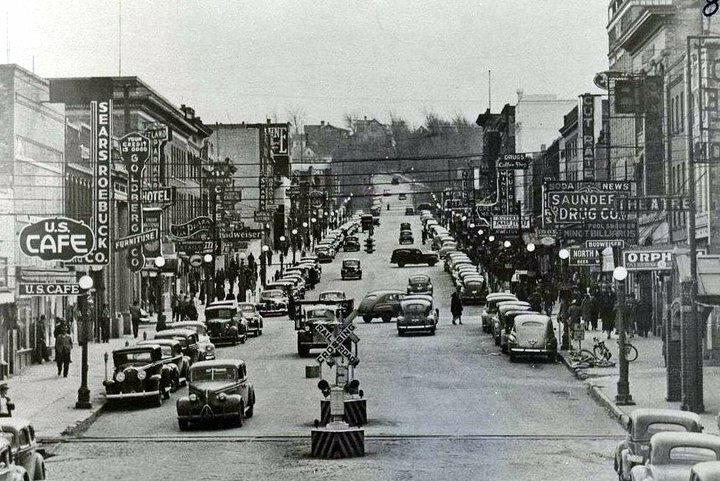 In 1961 the bids were opened for the projects to convert Highway 83 or Second Street, (now Broadway), to a four lane road. 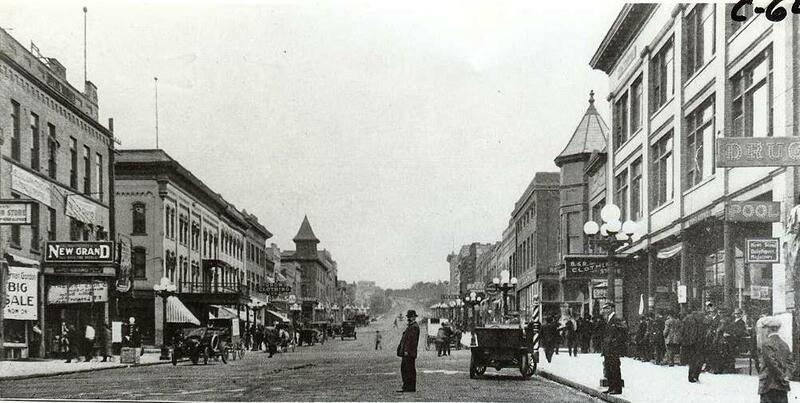 The project to convert Broadway to a four lane road was divided into two projects. Shultz & Lindsay from Fargo was awarded the bid to go from Central Avenue south to the city limits, (about where 20th Avenue is now). The cost of that phase was $757,968.00. The north project bid was $736,513.00. this converted Broadway to 4 lanes from the north end of the viaduct to three miles north. The project was paid for by special assessments to all properties inside the city limits. 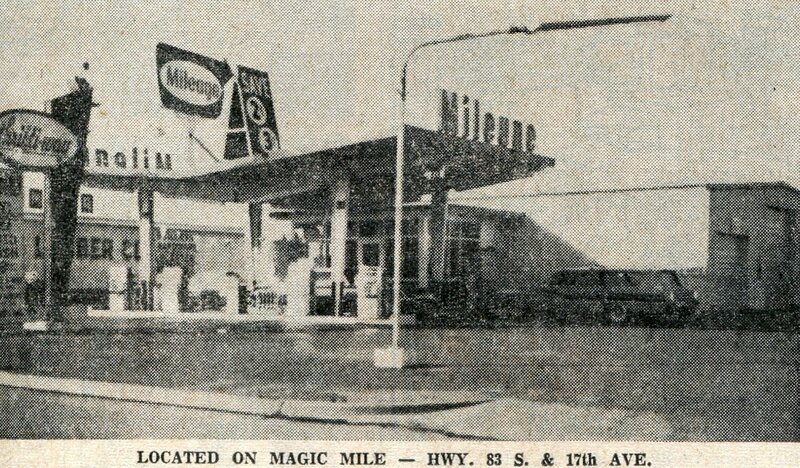 the Auto Dine in Minot was located at 8th Avenue and North Broadway. It was the home of the Big Otto Burger. The Minot Auto Dine was one of six. The others were located in Aberdeen, Moorhead, Bismarck, Fargo, and Grand Forks. 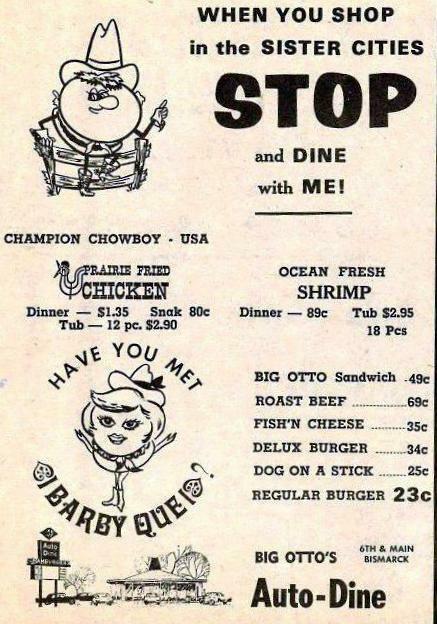 The Auto Dines also had a cartoon character depicing a western attired burger known as the Champion “Chow-Boy”. To celebrate the birthday of Big Otto Burger and drawing was held. The first prize was a Honda Model “50” motorcycle. Second prize was a GE portable TV and third prize a portable tape recorder. Past Concerts – On April 25, 1973 at the Minot Municipal Auditorium Black Oak Arkansas and Steeleye Spanwere in concert. Then on Tuesday, May 22, 1973, Celebration Concerts presented a concert at the Minot Municipal Auditorium featuring The Hollies and Maldoon. Both Concerts were at 7:30 pm. Tickets were $4.00 in advance and $4.50 at the door. Tickets available at Record Head, White Drug and B&B Drug. 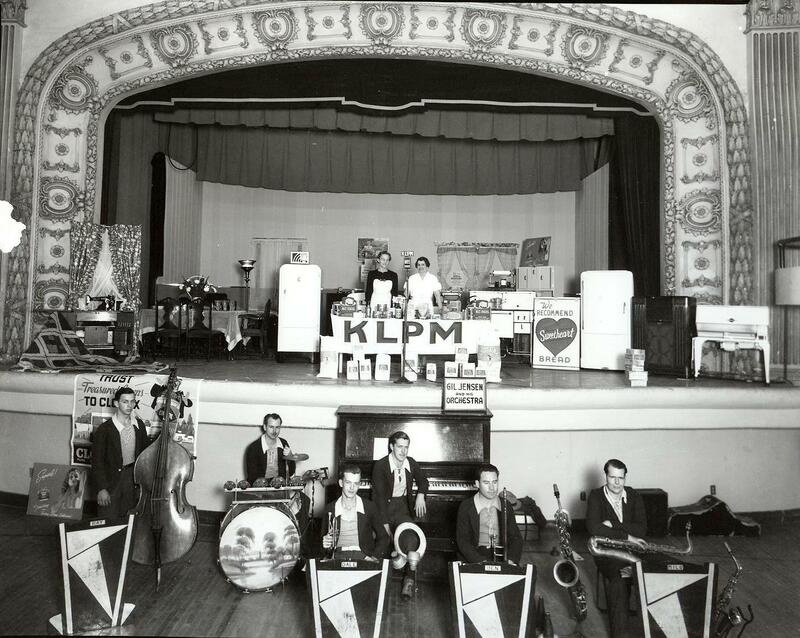 The Serendipity Singers – October 14, 1965 the Serendipity Singers were in concert at the Auditorium at 8 pm. Tickets for this concert were $2.00 in advance and $2.50 at the door. In 1961 construction was booming in Minot. Two shopping centers were under construction, Arrowhead and Oak Park Shopping Center. Town & Country Shopping Center would not be built for another couple years. A new science building was under construction at Minot State Teachers College as well as the Student Union. A new Junior High School was being built on the Washington Golf Course, (Jim Hill) and more school construction at the Minot Air Force Base. The new Post Office was taking shape, (the Post Office as we know it now.) A new hospital wing was nearing completion on St Joe’s Hospital which would bring them to over 200 beds. To add to the hotel rooms the International Inn was under construction, as well as the Sandman Motel, The Thunderbird and Gordon’s Holiday Spot was adding 40 rooms. AND … The park board was expecting the first nine holes of the Souris Valley Golf Course to open. Minot Men Hunting Gold at Denbigh – in 1932, three men from Minot, Joseph Gleske, Robert Hill and Christ Enger, employed by the Willard – Wallace Company were extracting gold from the sand hills at Denbigh. The special machine was made in Denver. Gravel enters the machine at the front. After a series of screens and filters, it removed larger sized pieces. The fine sand that was left entered “flotation” cells at the rear of the machine where it was agitated in water that had certain oils and chemicals added. Froth would rise to the top of the cells and was brushed into containers by small which scraped the surface of the mixture. They hope was to recover 90 cents of gold per yard of material at a cost of 15 cents per yard. Apparently it was not too successful as it did not last very long and is not around today. ND State Fair – 1961 in 1961 the Minot – ND State Fair ran for 7 days … Sunday through Saturday. Things were a bit different in 1961. You could park your vehicle for 50 cents. Admission was 50 cents for adults …25 cents for teenagers and children under 12 were admitted free. Grandstand admission was $1.00 for adults and 50 cents for children. The evening show in the grandstand for the entire week was The State Fair Review. This was a new production from Minnesota featuring 4 production numbers with 20 girls and 7 other acts. The afternoon grandstand show was either auto daredevil thrill shows or chuck wagon racing. Of course there was the midway with carnival rides and exhibits of all types. 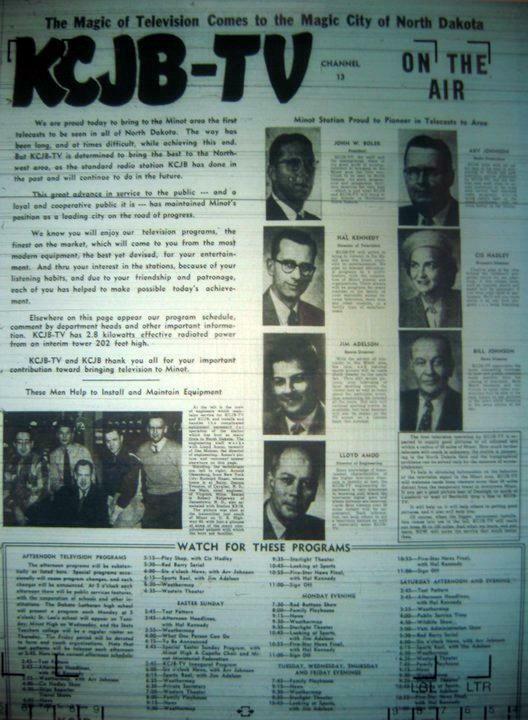 Another Minot Memory would be when KCJB TV went “On Air”. The first year they were at the state fair they did closed circuit from several locations on the fair grounds. The broadcasts were not very clear, having a lot of “snow” on the scene. This led to the famous statement of one fair attendee watching the dairy cattle judging in a different building. His statement to his wife was “lets go over to the dairy barn, its hot here but looks like it’s snowing over there" “Live” TV at its best.... KCJB-TV is now KXMC-TV. In December of 1967, Walt’s Standard was holding their grand opening. 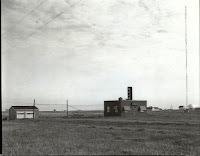 Located at 1340 South Broadway, Walt’s Standard claimed to be Minot’s most modern service station and they were open 24 hours. The owner manager was Walt Gutknect. The first 244 customers received a free 5 quart plastic pail. Registration for a door prize could get you a waffle iron, electric percolater, skill saw, electric drill or one of many other prizes. With the purchase of 10 gallons of gasoline you received a free 8-pack of 7-Up and S&H Green stamps. Interesting note – gas was probably about 50 cents a gallon at that time…. Also the 8 pack of 7-Up was glass bottles. Self-serve Car Wash – in August of 1965, Al Jundt, owner of Southdale Texaco on the corner of South Broadway and 18th Avenue opened a new type of self-service car wash. The car wash had 6 stalls, two open and 4 closed stalls, all equipped with high pressure washers that spray on a special detergent for cleaning with soft water to eliminate streaking. Each stall also had a vacuum cleaner for the cars interiors. The enclosed stalls also had infra-red gas heaters for winter operation. The car wash was open for 6 am to midnight, seven days a week. 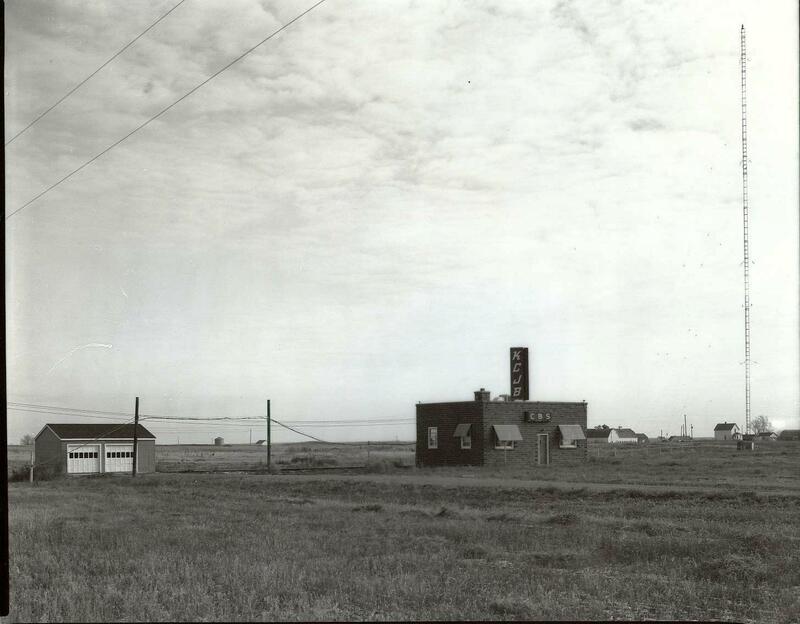 On May 1, 1961, North Central Airlines began daily air service between Minot and Regina, Sask. The event was kicked off with a pre-inaugural invitational dinner on Sunday, the day before. The dinner was held at the Tree Top Room in the Clarence Parker Hotel. At noon on Monday the ribbon cutting ceremony was held at the airport. The ribbon was cut by Lt. Gov. Orville W. Hagen. The color guard from the Air Base was on hand and a short concert by the Minot High School Band. The first flight left for Regina at 12:40 pm. The return flight was to arrive at 4:04 pm and then continue on to Minneapolis via Grand Forks. the year was 1961. The date was July 20th. The event was the grand opening of Clara’s Kitchen. The restaurant was located at 119 South Main Street. The hours were 7 am to 11 pm, Monday through Saturday and 8am to 6 pm on Sunday. Grand opening specials:… Pancakes and Coffee – 25 Cents ….. Dinner with salad and roll and drink – 65 cents …. Hamburger and malt – 29 cents …. And a donut and coffee for 10 cents. 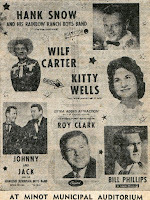 November, 1962, a Country Cavalcade of Stars appeared at the Minot Municipal Auditorium.. The Headliner was Hank Snow. 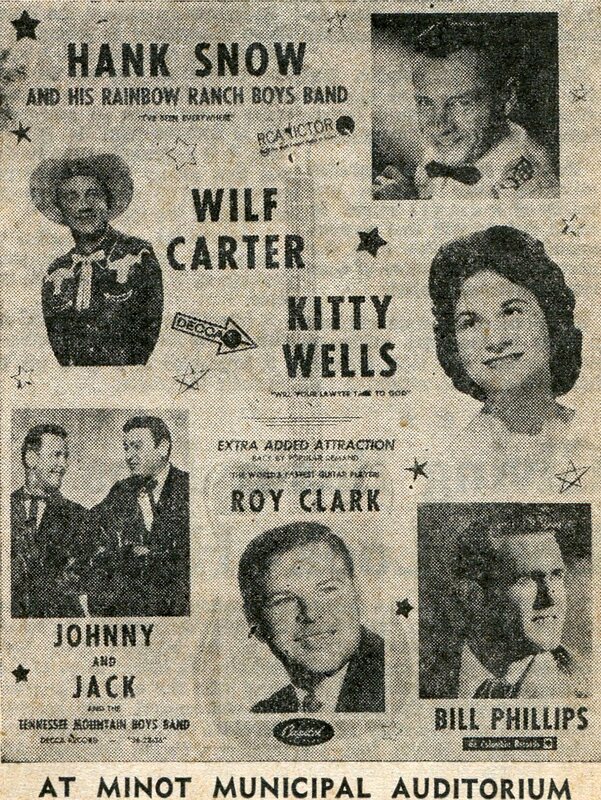 Also on the venue was Kitty Wells, Wilf Carter, Roy Clark, Bill Phillips, as well as Johnny and Jack Advance tickets were $1.50. Ticket prices at the door were $1.75 for adults and children under 12 fifty cents. 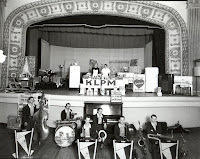 Ticket locations were Northwest Piano, Arrowhead Records and Mitchell Hardware. August, 1964, Roy Orbison was in concert in the Minot Municipal Auditorium. At the time he had just released his big hit – Pretty Woman. Advance tickets could be purchased at Northwest Piano, Arrowhead Record Shop, Oak Park Dairy and Main Radio & Record shop. Western Auto – After 30 years in business in Downtown Minot, The Western Auto Store moved to its new and final location at 300-3rd St SW in November, 1962. The new building was 100 ft wide by 120 ft long. It included a 40 x 60 foot shop as well as offices. The merchandise display area was 24 x 50 foot. The business was staffed by 12 employees. A loading dock was in the back of the building and large parking lot in front. Western Auto in Minot was established in 1930 after evolving from a automobile wrecking business. The main office was in Minot until 1950 when it was moved to Fargo. 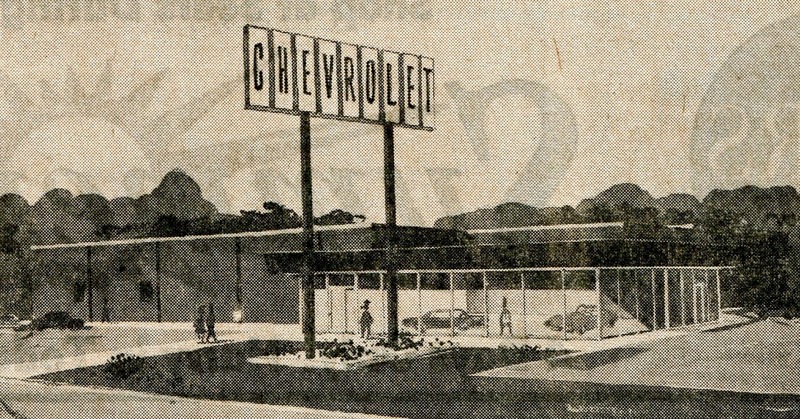 Western Auto also had branches in Williston, Devils Lake, Bismarck, Mandan, Grand Forks, Jamestown and Dickinson. At one time Western Auto was the largest automotive wholesale supplier in North Dakota with the Minot store being the largest.